Trump NewsTrump GovernmentTrump PoliciesTrump Domestic PolicyIs Comey the First FBI Director to Keep Memos on a President? Is Comey the first FBI director to keep memos on a president? The FBI’s history shows such documentation can be essential to how FBI directors operate, and how they can insulate or protect the FBI’s integrity. President Donald Trump allegedly asked FBI Director James Comey to drop the FBI’s investigation into Michael Flynn. President Franklin Roosevelt asked FBI Director J. Edgar Hoover to collect information on Americans who had committed no crimes. President Richard Nixon asked Hoover to provide the White House a list of reporters the FBI knew were homosexual. How do we know? FBI director memos. As an FBI historian, I was not surprised to learn that Comey kept memos. The FBI’s history shows such documentation can be essential to how FBI directors operate, and how they can insulate or protect the FBI’s integrity. In the summer of 1936, Roosevelt met the FBI director in the White House to discuss, according to Hoover’s memo, “subversive activities in the United States, particularly Fascism and Communism.” Hoover wrote that FDR was interested in getting from the FBI “a broad picture of the general movement and its activities as may effect the economic and political life of the country as a whole.” Hoover replied that “no governmental organization” collected that kind of information. Nobody collected that information because of FBI improprieties dating to World War I and the Red Scare of 1919 to 1920. During that period, the FBI had collected political intelligence on prominent politicians, social justice advocates and others it perceived as dangerous. In response, Attorney General Harlan Fiske Stone publicly issued investigative guidelines that banned FBI agents from collecting intelligence related to noncriminal activity. Notwithstanding these restrictions, FBI Director Hoover informed the president that a statute from 1916 allowed the FBI to investigate “any matters referred to it by the Department of State.” Roosevelt, though, was “reluctant” to formally ask the State Department for this request because information was constantly leaked from the department. Instead, he asked Hoover to return to the White House the following day with Secretary of State Cordell Hull. The president promised Hoover he would write his own memo about his request and place it in his White House safe, but such a document has never been located in FDR’s presidential papers. Hoover’s memo about the meeting remains our only historical source about it. The presidential directive to the FBI then remained a verbal one, albeit secretly documented by Hoover, with no White House-generated paper trail. The meeting and memo were significant because they marked a shift for the FBI. Because of the president’s request and Hoover’s own interests, the FBI began prioritizing noncriminal intelligence investigations over criminal ones. This is the point where the FBI became, primarily, an intelligence agency. Hoover would thereafter collect massive amounts of noncriminal-related intelligence on Americans both prominent and common. A second example of the FBI director generating a memo about a sensitive presidential request dates to Nixon in 1970, during Hoover’s final years as FBI director. At that time, Nixon was obsessed with the constant stream of leaks from his administration and in discrediting the leakers. 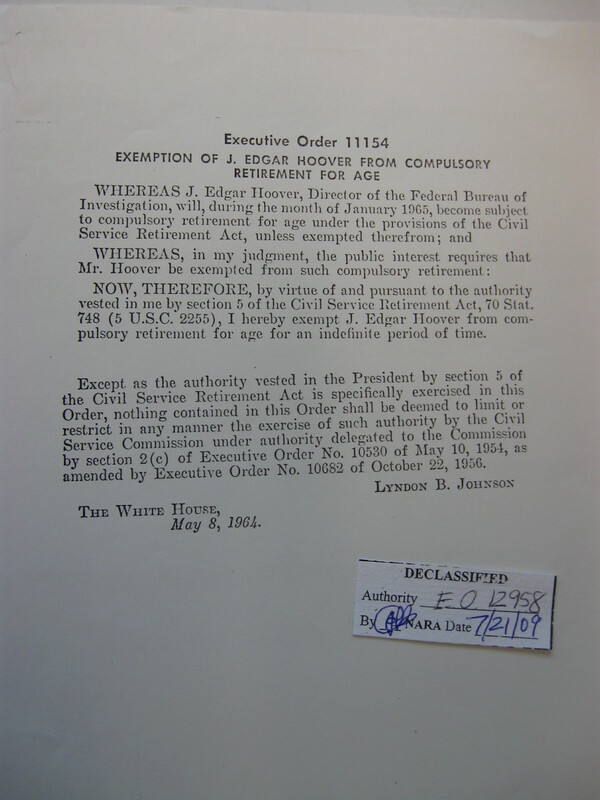 In 1970, Hoover had passed what was then the mandatory retirement age of 70. He remained FBI director only because President Lyndon Johnson had issued an executive order exempting Hoover. Nixon could revoke that order at any time. With his job vulnerable, Hoover willingly complied with Nixon’s request. Hoover’s FBI also actively collected and disseminated information about gays, and Nixon knew this. 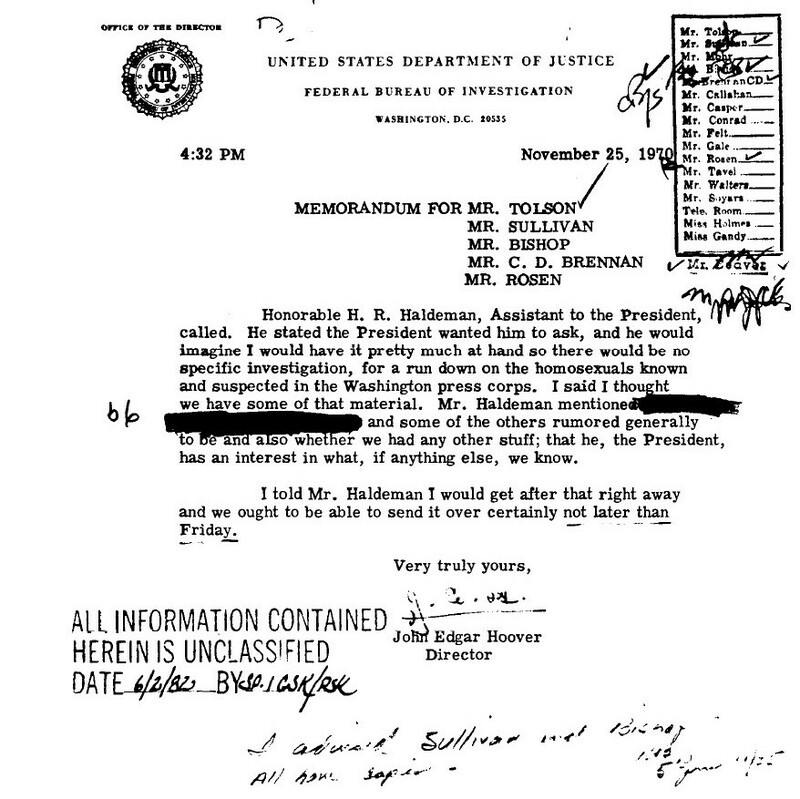 Handwritten notes on Hoover’s memo – the only record of the request, sent to Hoover’s top FBI officials – indicate that the FBI compiled the requested information and sent it to the White House in letter format, dated Nov. 27, 1970. To date, this letter has not surfaced either at the FBI or among the Nixon papers. Because we don’t have the letter, we also do not know the exact content of the information Hoover shared, or whether and how Nixon might have used it against reporters. Hoover was an astute bureaucrat who had a history of dealing with sensitive or controversial presidential requests. He fully realized, like Comey, the value of documenting his interactions with presidents. Hoover knew that if need be, he could produce the memo as proof he was ordered to do something that, if undocumented, might jeopardize his position as FBI director or lead him to legal trouble. In other words, the memo was a get-out-of-jail-free card. It seems a similar situation may be unfolding with Comey. President Trump implied or boasted he might have tapes to use against Comey. But Comey actually documented his interactions with the president. The Comey memos and the FBI’s history shows how a careful bureaucrat in charge of a powerful agency can not only deftly protect himself, but the integrity of a democratic institution.